Professor Joe has a deep passion for teaching and helping others. With that passion he started Authentic BJJ in 2010 and wanted to bring real Self Defense Brazilian Jiu Jitsu/Gracie Jiu Jitsu to Parker, Colorado. As a youngster he started competing in sports at age 5 and having an older brother to chase around, made him natural athlete. He began wrestling in Pennsylvania the Mecca of the sport at age 6 in 1977 where he competed up until high school and gave it up to pursue his football career. He is an accomplished competitive athlete with over 27 years of coaching experience. He played both Football and Lacrosse in college where he lettered 4 years in both. He also coached Football and Lacrosse in the the Denver area for over 15 years. He is a well-respected mentor and leader to many young athletes. Professor Joe Stopped competing in 2010 to focus on teaching of Brazilian Jiu Jitsu /Gracie Combative Jiu Jitsu in the Parker community where he resides. Professor Joe believes with a stronger and more confident younger generation he can make a positive change in our community. He is a dedicated husband and father with a son, who has followed in his footsteps training Jiu Jitsu. His passion for helping people drives him as a student and head Instructor. Jiu jitsu without boundries! 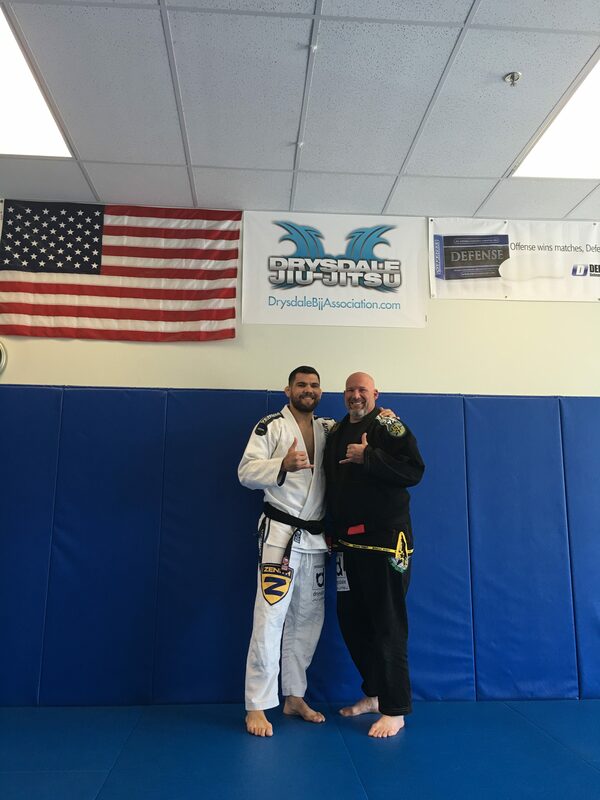 Professor Joe is a recognized IBJJF Brazilian Jiu jitsu Black Belt under 6x World Champion/ADCC Absolute Champion and current professional fighter Robert Drysdale. Professor Joe also holds a Certified Gracie Jiu Jitsu Purple belt under the Gracie Academy. He is a Brazilian Jiu Jitsu self defense Certified Instructor. Professor Joe is a “Keep it Playful” guy and a constant joker. He believes strongly in the basics of self-defense training that has been passed down to him from Professor Drysdale and The Gracie Academy where he has trained and studied for the last 6 years. He has traveled the US and Brazil to learn as much as he can about the gentle art. His Jiu Jitsu has no boundaries! See You On The Mat!!! !